Flo was raised alongside her eleven siblings in the industrial town of Huyton, Liverpool. After meeting her late husband Richard at the age of 21 whilst working at the sausage factory, Flo started to bake delicious treats for their three young children. When her husband died two years ago, her son Stephen encouraged Flo to start baking again to help her deal with the grief and she likes to help her son out by baking for his restaurant. Today, when she’s not singing karaoke or having a boogie with her friends, Flo prides herself on being a homely, traditional baker and loves nothing more than baking for her family to keep them happy, healthy and together. 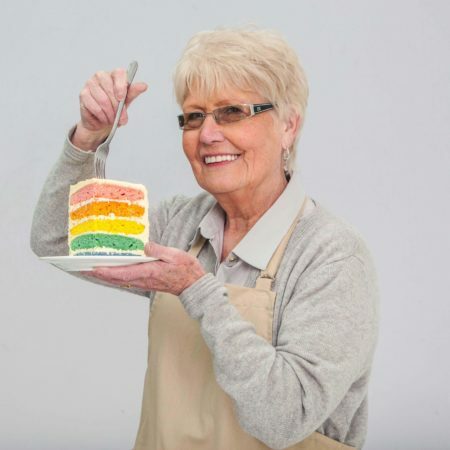 At 71, Flo is the show’s eldest amateur baker to take part in the series to date. Flo’s all about the bakes, and her One-in-a-melon illusion cake ticked all the boxes as her debut Showstopper. A gin and jam sandwich, in biscuit form. Is there anything more appealing? Flo’s Biscuit Week Signature bake is a crowd-pleaser at any party.